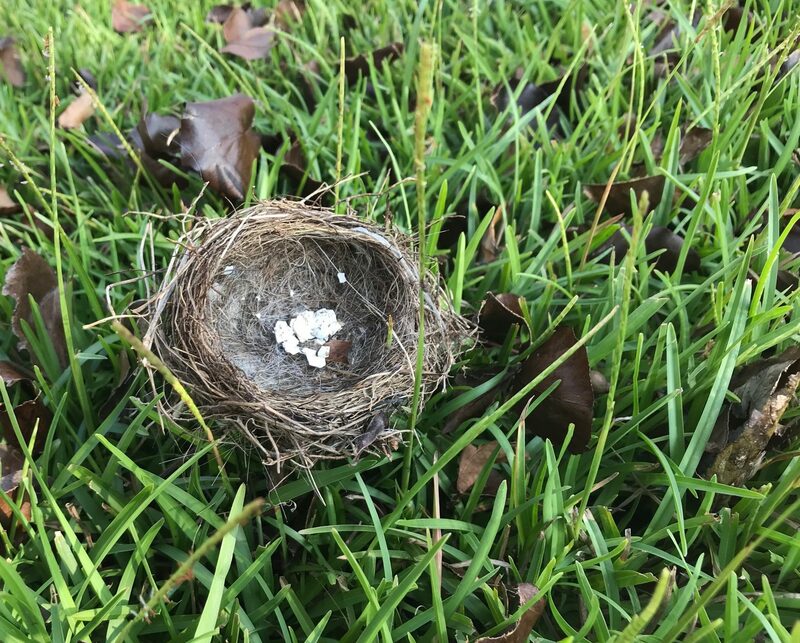 While I was cleaning up some of the devastation that was 2018 Atlantic Hurricane #F today, I found this bird’s nest. They lived in a tree in my front yard. It is a dogwood tree, and I think I am actually allergic to the pollen of that species. I would have liked to cut it down, but it makes a pretty good shade tree over the driveway. A couple of days ago, Hurricane #F blew away some of the smaller branches. The storm did what I should have done — which was trim away some of the lateral branches that were starting to extend too far over the driveway. Also, these birds were building nests on higher branches, so if I ever parked my car under the shade, the birds would usually crap on my car. “Dang it birds” I thought … “Always crapping on my car, and oh no … not down the passenger window … again”. Who is going to get into the passenger seat with a big stream of bird doo doo running down the window? Stupid birds. The long branch that was growing and extending over the driveway is no longer a problem. I have to feel sorry for the bird and its nest of eggs that were destroyed. They couldn’t have possibly understood what was happening to them.